For those of you who thought your MMA reality show fix was fulfilled with Friday’s episode of “The Ultimate Fighter: Live,” think again. “The Ultimate Fighter: Brazil” premieres tonight at Midnight ET/9PM PT on TUF.tv. What? You don’t understand Portuguese? No worries, because English subtitles will be included. The first international edition of the long-running series will stream every Sunday during the same time slot. 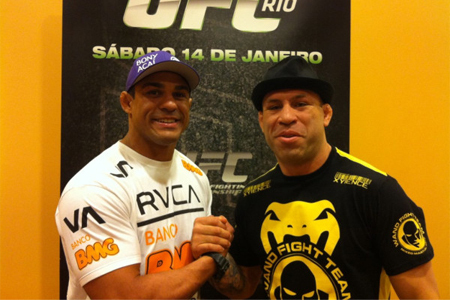 Wanderlei Silva and Vitor Belfort (Pictured) will serve as opposing coaches on the show. The Brazilian icons will tutor featherweights and middleweights as they battle to secure their futures with the world’s premier mixed martial arts promotion. The season’s finale will take place June 16th at a yet-to-be announced venue in jiu jitsu country. Belfort and Silva will also collide in the card.